The Kellogg Company (NYSE: K; informally Kellogg’s or Kellogg) is a multinational food manufacturing company headquartered in Battle Creek, Michigan, United States. Kellogg’s produces cereal and convenience foods, including cookies, crackers, toaster pastries, cereal bars, fruit-flavored snacks, frozen waffles, and vegetarian foods. 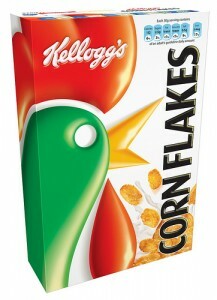 The company’s brands include Corn Flakes, Frosted Flakes, Rice Krispies, Special K, Pringles, Pop-Tarts and Nutri-Grain. Kellogg’s products are manufactured in 18 countries and marketed in over 180 countries. Kellogg’s largest factory is at Trafford Park in Manchester, United Kingdom, which is also the location of its European headquarters. Kellogg’s holds a Royal Warrant from HM Queen Elizabeth II and the Prince of Wales.